Although Islam does not know an official canon of saints, the concept of sainthood is not foreign to Islam. The Qur'an states that there are "friends of God" who have an especially close relation to the Allmighty and enjoy "the good tidings in the present life and the Hereafter". But who the friends of God are and how they should be honoured is a matter of controversy among Muslims. In the mystical currents within Islam, saints have high esteem. They are believed to embody the grace of God, and by being close to His friends, one can also have a greater share of the Lord's grace. Other currents within Islam, especially but not only the Saudi Wahhabis believe that such idea of mediation between the believer and God is opposed to monotheism, the central creed of Islam. Islamic mystics (Sufis) of course do not see themselves as polytheists as they often are claimed to be by their opponents. In their view, they do not worship the saints, since worship in Islam is for God alone. 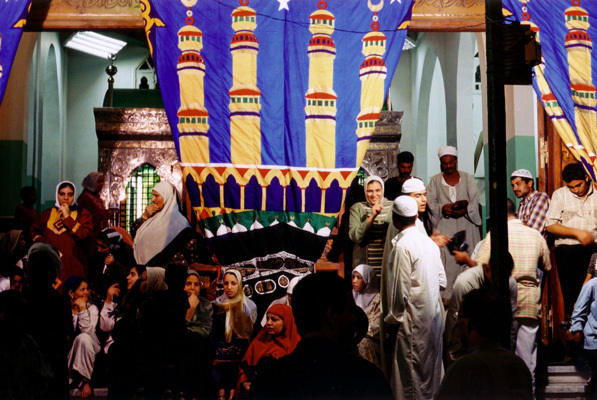 They point out that love of the Prophet Muhammad and his descendants (most Muslim saints in Egypt are descendants of the Prophet) is a central part of Islamic spirituality, and that the critics fail to understand the difference of love and worship.